Over 400 athletes came out for the premier event on the domestic BMX calendar, the Canadian BMX Championships, which returned to Drummondville, Quebec, after a two year absence. Titles and maple leaf jerseys were awarded in the women's and men's categories for Junior (17-18) and Elite (19+) categories, with medals awarded in the Challenge classes for age group racing from as young as 5 years old. 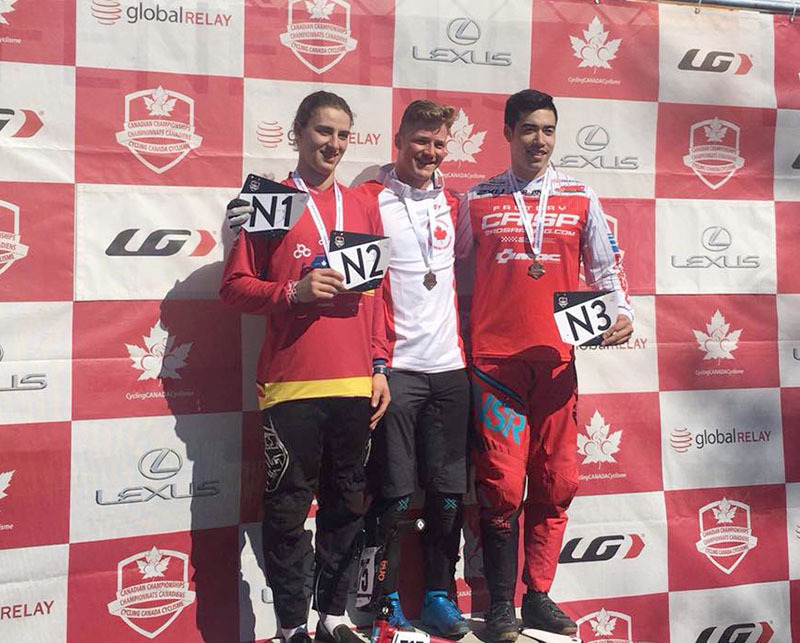 "As expected, Club BMX Drummond offered another first class Canadian Championship event in 2018," said Josh Peacock, Competition Coordinator at Cycling Canada. "We saw plenty of thrills and spills, and are thrilled to crown our new Canadian Champions. Congratulations to all of our N plate winners, and a big thank you to all of the dedicated volunteers and officials who contributed to the success of this event." British Columbia, Quebec, Alberta dominated the titles, with each province taking national champions jerseys, including two for Alberta. Aidan Webber of Nanaimo, BC, is the new national champion for Junior men, with Benjamin Ouellette taking the silver medal and Alex Grecht the bronze. 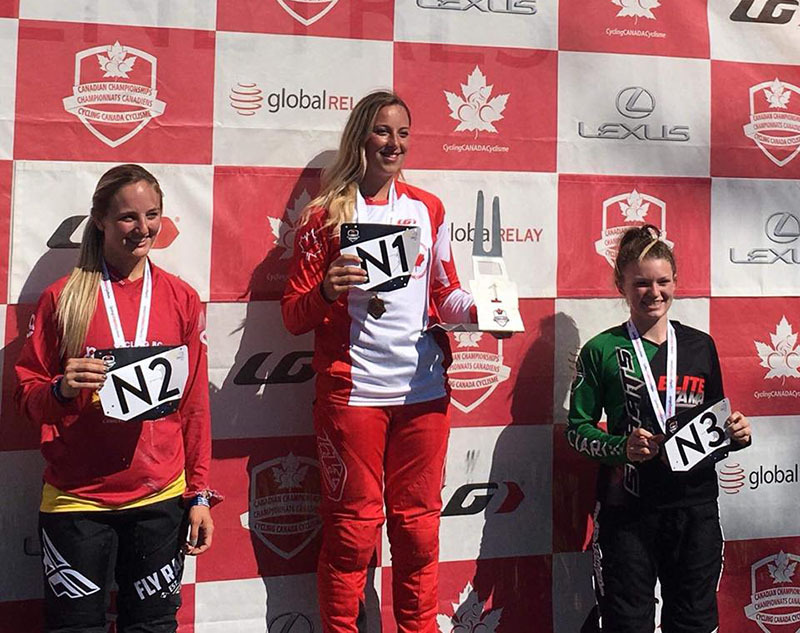 In the Junior women, Avriana Hebert of Edmonton, Alberta defended her national title, finishing fourth among the Elite women, followed by Alison Grecht of Parksville, BC. "This is one of my favourite tracks," said Hebert. "It's downhill, it's fast and it's fun to race on, which makes for good racing. It's an honour to show the [national champion] sleeve when you go to races." "Winning the national champion's jersey really shows all the hard work I've put in," said Webber, "because I was injured last year and missed out on national champs. So, getting it in my last year as a Junior really means a lot to me. My final was really good right from the start; I had an amazing gate and was able to get to the inside of the straightaway right away and hold off the competition all the way to the line. It's a huge confidence booster." The Elite women's title was a battle between two World Cup riders, defending champion Drew Mechielsen of Langley, BC, and Daina Tuchscherer of Chestermere, Alberta, with Tuchscherer taking the title. "The track was running really great today," said Tuchscherer. "All these girls I raced against have trained super hard, so it was awesome to fight my way to the top. I haven't won this before, so it will be an honour to wear the maple leaf for Canada." In the absence of defending champion Tory Nyhaug, who is recovering from an injury, the Elite men's title was a three-way battle between World Cup riders James Palmer of North Vancouver, BC, Alex Tougas of Pitt Meadows, BC, and local Drummondville favourite Gaby Malenfant. Malenfant managed to slip by Palmer and Tougas in the final corner to take a popular hometown win. "It was awesome to win at home," said Malenfant. "The fans are super cool here and I'm proud and happy. It's a technical track, with not a lot of speed, so there a lot of moves happening in the corners. I like technical tracks, so it is an advantage for me."